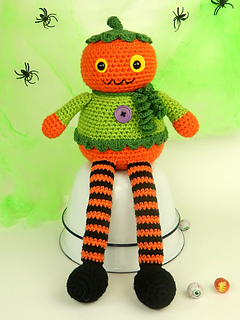 Halloween Longlegs make perfect shelf sitters for your Fall display, or cuddly dolls for Halloween gifting. 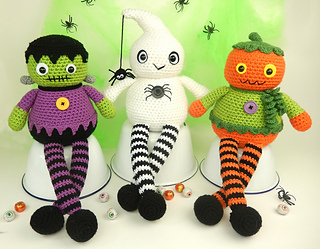 Frankenstein’s Monster (also known as Fred), Gilbert Ghost and Pammy Pumpkin are very quick to crochet as their bodies are made by using doubled up yarn. 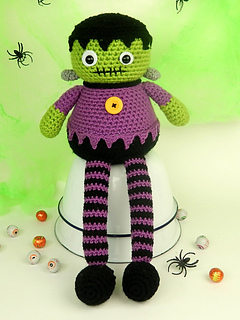 Leave the legs off entirely and you can use them as doorstops too! 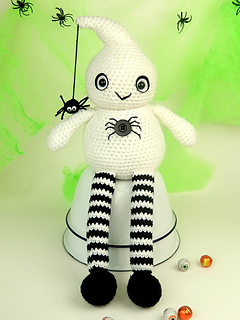 Each Longlegs doll measures a substantial 16” (40 cm) tall, when made with light worsted weight (DK/8 ply) yarn and size D (3.25mm) and size G (4 mm) hooks. 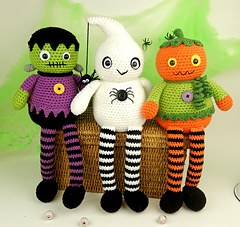 Suggested safety eye size - 12 mm.